When you travel and you want to stay connected. You should consider using a wireless travel router. These handy little routers work well when you are on the road and need to hook up to a good wifi signal. Using one of the top 10 best wireless travel routers in 2019 is the choice to make. That is because they are designed to work under all conditions and make sure you stay connected. They have the power you need and the different accessories and ports to meet your connection needs. When you go looking for a wireless travel router consider the ones that made our top 10 best wireless travel router in 2019 list. They are the top of the line equipment and shouldn’t let you down when you need them most. To find which ones made our top 10 list just continue to read this review. It is filled with lots of information you may find useful when you travel. Some people do not like those portable routers and then some swear by them. They are handy little devices to have as part of your computer equipment despite any disadvantages. 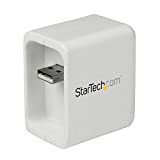 One of the great attractions of this travel router is you can back up your files and transfer data from SD cards to USB or hard drive to your smartphones and so on. You get to free up needed space on your other devices. You can get instant wifi access with the right password, but this travel router is not hotspot or VPN supported. Plus, you can transfer photos, videos, and other data with little hassle to family and friends. This router is compatible with Chromecast and other data sharing systems. Its upgraded chip and RAVPower Filehub technology make this device compatible with a lot of tools that work well with computers and other devices. An external battery pack and built-in 6000 mah power bank ensures that you get enough power when you need to work for long hours. 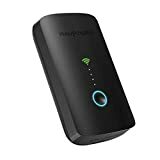 This wireless travel router works with a 10,400 mah external battery to bring you the b connected to the internet possible. With that much power at your disposal, you can back up or transfer files between your computer, phone or tablet with ease. At the 2.4 GHz frequency you will get up to 300 Mbps speed, but you will not be able to use it with a VPN and it is not a hotspot. Like other wireless travel routers, you can send family and friends your treasured photos, videos or other projects with little trouble. The device is compatible with Chromecast, Roku and other DLNA supported devices. This is all done through its App HooToo TripMate Plus technology. You can charge your smartphone up to 3 times using this wireless travel router. There is just one drawback to this device. It is not compatible with the Xfinity Hot Spot system. Get the most out of your laptop and internet by hooking up to this little wireless travel router. You can use it almost anywhere you go and turn a bad internet location into a good hotspot. Its 2.4 GHz frequency brings you lag-free 300 Mbps internet and gaming speed. This password and SSID protected device are compatible with Chromecast. Its flexibility in charging allows you to use different power sources to keep the wireless travel router up and running at optimum levels. 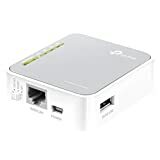 The usual data and file sharing capabilities are included on this router and it is small enough to pack safely in your suitcase or backpack when you leave home for an extended period of time. It will also work with Amazon firestick and wen at home, the router can extend wifi signals and give you a better range of service. This lightweight router does not add much weight to your suitcase. But it can produce a strong wifi connection and a great internet signal using the ethernet system. Its dual-band technology provides you with good HD quality on your videos and other streaming efforts. You can keep the router charged through its micro USB port and it is compatible with multiple power sources. 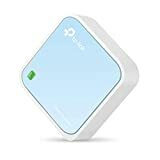 You can share your important files, surf the internet, and do other important internet tasks with ease with this pocket-sized wireless travel router. With its upgraded technology, you can reach internet speeds up to and over 700 Mbps. Also, this router can extend the range on your wifi equipped devices and remove dead spots that lie around your home. It is easy to use and connect to different internet signals. For example, a hotel’s complimentary wifi service. This is a different device than the previous HooToo wireless router mentioned above. 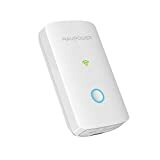 But it still provides the same great connection service and the same effortless file and data transfer you expect from a HooToo device. It is compatible with iPhones, Android phones and other wifi equipped devices like tablets etc. You can also use this device to back up important files that need extra protection. It is flash drive compatible. When you want to stream videos, movies, and television shows, this is the device you want on your side. The router will work with TVs, media devices, Chromecast and alit more. One switch turns it on and helps you connect to the internet no matter where you are. This lightweight device weighs only about 1 ounce and is protected with a 1-year warranty. It won’t weigh your suitcase, travel case or backpack down. When you travel, you want to be able to connect effortlessly to the internet. You want this done with as little trouble as possible as your loved ones are waiting to hear if you arrived safely or not. With this unit, you can get up to 100 Mbps internet speed, compatibility with 3g & 4g networks, as well as a quick and easy to use security set-up system. Keeping your data secure is important. This unit works with the following standards IEEE 802.11n, IEEE 802.11g, IEEE 802.11b to make sure you get the quality you expect for your money. When you place it in AP mode, you can extend the range of your other limited range wifi devices. Using the setting options, you can bridge networks with a little work. Plus, t works well with the WISP system. Compact and lightweight, it is a great router to travel with. Access any wifi signal or network with this portable and compact wireless travel router. You can create your own hotspot and work with just about any wifi enabled device. Plus, it will work with Apple’s iPad and other tablets and phones, etc. Another added feature is its ability to take one device wifi network and multiply the service to accept more than one device. Getting the router powered up is not difficult. Just hook up the router via US cable to any legitimate power source and soon the router will have enough power for action. This router will also extend the range of other wifi equipped devices and hook up to different wifi signals in hotels, the office, and so on with ease. When you purchase this unit, you get the router, a USB cable, and the instruction manual. The manual will provide you with all the information you need to know to use the router correctly. 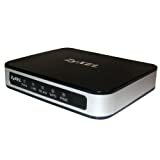 When you purchase this wireless travel router you are getting 3 devices in 1. Not only will this hook you up to the internet via wifi signals, but it will also act as a bridge and an access point. It is powerful enough to work with more than one device at the same time. You also get power charging flexibility. This device is compatible with both USB and AC charging sources. The 802.11n wireless technology gives you internet speeds up to 150 Mbps with little or no lag time. Its compatibility is almost limitless. The device works with handheld gaming units, smartphones, tablets, and other electronic devices. Just look in the instruction manual to get a complete list of devices this router will work with. Other features include VPN pass through, NAT, and SPI which protects your device from cyber attacks. It is also password and SSID protected. You can upload from an Sd card or from your computer or USB flash drive. It makes no difference to this router. The data transfer speeds reach about 8 to 12 Mbps. Then when you use the 2.4 GHz frequency, you can get up to 300 Mbps. But that those speeds pale in comparison to the 5 GHz internet speed which reaches 433 Mbps. This device works via AP mode, router mode, or it can be a bridge. But it cannot work with VPN systems. 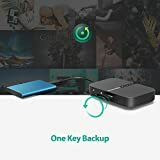 It is compatible with a variety of smartphones, tablets, and external hard drives so you can send your data, videos, and other information securely across the nation or world. It is also compatible with Chromecast, Roku and other DLNA devices. This wireless travel router can do it all including hooking you up to the hotel wifi service. One other drawback is that it does not hook up with RAW systems for some reason. White is a good color when using a wireless travel router. It just looks like the good guy it really is. A 6,000 mah external battery pack helps keep this good guy powered and ready for service. Plus, you get great file and data transfer service. Your friends and family can enjoy your videos and photos almost instantly when you send them updates to your life. This router will work with Sd cards, flash drives, tablets, smartphones as well as other communication devices. It is also compatible with Chromecast, Roku and more so you can get the full benefit of the internet network. With it’s built-in 6,700 mah power bank, you can recharge your phone when its battery gets low. 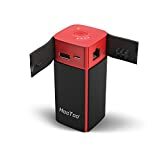 When you are on the go and headed out the door on your next business trip, this unit packs away quickly, and without adding weight to your travel bags. The internet has become a vital part of the communication aspect of society. It has also become a vital part of many people’s lives. They love to share their information with their family, friends and even the world through different media outlets. One way to make this connectivity and communication a great success is to use one of the top 10 best wireless travel routers in 2019. When important information and data needs to be sent you want to have the best equipment working for you. These units are built to give you the top service possible and the flexibility you need when you are in different parts of the world. 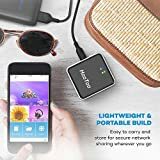 They have the compatibility to work with your electronic devices including your smartphones and be able to handle streaming, so you won’t miss your favorite movies or shows. When you want top quality service, you need to go with the best of the best.